Where Spotify leads, others follow. One of Spotify’s best features are its curated playlists that populate with songs that the streaming service’s algorithms think you’ll like, and they’re usually spot-on. So it’s no wonder the competition is copying the idea. In September 2018, Pandora copied Spotify with The Drop Pandora Copies Spotify With Curated Playlists Pandora Copies Spotify With Curated Playlists Pandora has launched The Drop, a curated playlist that automatically populates with new songs Pandora thinks you'll love. Read More , a playlist comprised of new songs by artists you like. And now Tidal is getting in on the action with what it calls My Mix. The idea being to save Tidal users from having to find new music for themselves. 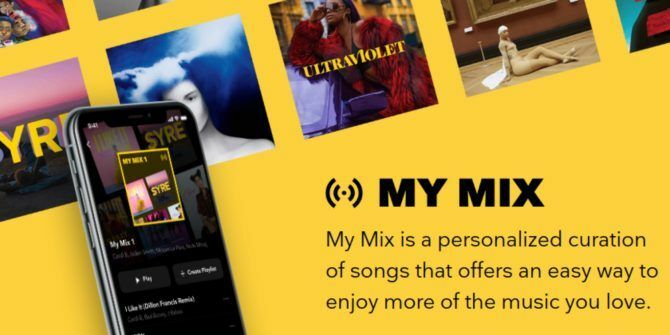 Each user will receive up to six playlists containing a maximum of 50 songs apiece. These will be grouped by genre or artist, hence the need for up to six different playlists per person. If you have a very narrow taste in music you might only get one playlist. The key thing is that these playlists will be continually updated. Essentially, the more music you listen to, the more Tidal can finetune your My Mix playlists. Once you’re happy with Tidal’s selections you can save each playlist to your collection. My Mix is essentially Tidal’s take on Spotify’s Daily Mix, which have been a thing since 2016. Apple Music also offers a similar feature with its For You playlists. So this is less about Tidal innovating as it is about Tidal catching up with the competition. We weren’t exactly impressed when Tidal launched in 2015 Why Jay Z's Tidal Music Streaming Service is Doomed to Fail Why Jay Z's Tidal Music Streaming Service is Doomed to Fail Jay Z recently relaunched Tidal, the music streaming service he acquired for $56 million. Tidal has 99 problems, and the pitch is one. Read More . However, since then Tidal has become more appealing to audiophiles Tidal Ups the Ante to Appeal to Audiophiles Tidal Ups the Ante to Appeal to Audiophiles Not content with merely offering high-fidelity audio, Tidal is now adding what it calls "master-quality recordings". But will this be enough to tempt people to subscribe to Tidal? Read More and partnered with Plex You Can Now Stream Tidal Music Directly From Plex You Can Now Stream Tidal Music Directly From Plex Plex and Tidal have partnered up to bring the streaming music service to the media center app. Read More . So it can’t be all bad. My Mix adds another reason to give Tidal a second look to see if it’s worth the money. Explore more about: Playlist, Streaming Music, Tidal.